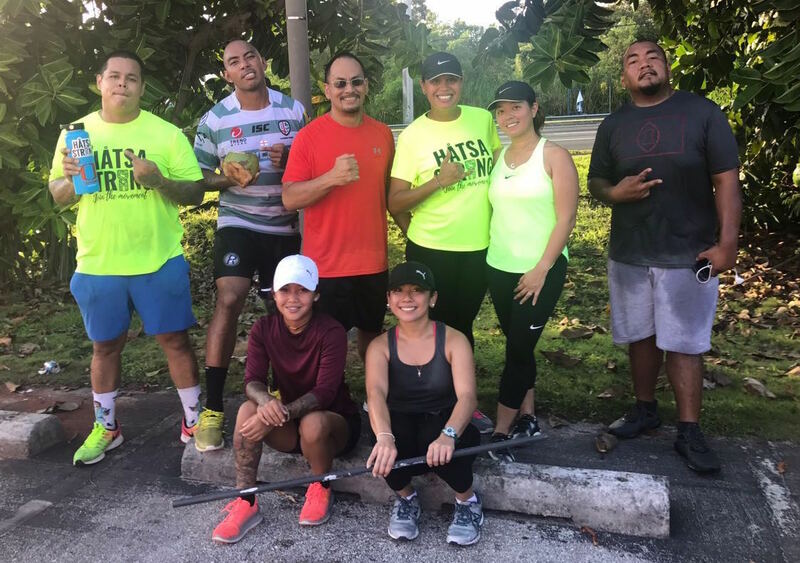 From Merizo/Inarajan to Yigo and back, Ray Chargualaf and a handful of willing warriors spent their Father’s Day weekend traveling 71 miles around Guam for a challenge like no other. The owner of Hatsa (Helping All Types Sizes Ages) was inspired after a deep dive through Instagram where he found an athlete going through intense styles of training. The videos inspired Chargualaf enough to want to start pushing himself to his limits given that his current position as a professional health and nutrition instructor requires him to push his students past their comfort zones. “I wanted to do a challenge that was cultural based and it got me thinking about how people on Guam would have traveled to places over 200 years ago. Anytime they had to deliver a message it was on foot. So our goal was to recreate going around the island and using only natural resources,” said Chargualaf on his inspiration. Natural resources included river water and local fruits, which consisted of watermelon, manha, avocados and to’a, also of which were donated by local stores and supporters. “My body wasn’t accustomed to it which is what made going ‘all-natural’ the hardest part. I’m used to having recovery drinks or an intake of certain types of electrolytes, but my body didn’t respond from a performance standpoint,” said Chargualaf. The only prior training Chargualaf had in preparation for the 71-mile journey was a 28-mile run and a 7000 tire flip through the villages, which gave him confidence. At the 20-mile mark of his 71-mile run, Chargualaf started to get in the right head space when envisioning the gratifying finish. Chargualaf is a certified trainer and his resume through experiences gained off-island speaks for itself, but that wasn’t enough for him. To him, his local footprint needed to be bigger and trucking through Guam presented one of those opportunities to leave a big one. “I’m always looking for ways to reinvent myself. I’ve been back on island for a little over a year, but I’m taking it personally to build my one resume here on island. I’m a ‘what have you done lately’ kind of guy,” added Ray. Chargualaf gulps down juices from the fresh manha after his run through the island. Ultimately, Chargualaf is doing his best to give people on Guam a sense of direction. Whether it be people who are looking to get in shape or those looking for a greater grind, Chargualaf wants set relatable standards. “If I’m going to really be the best at what I do, I need to put myself in the best position educationally and physically. I can do 1000 pull-ups, but not everyone can relate to doing 1000 pull-ups. What they can relate to is traveling a distance, they do it everyday,” added Chargualaf on the journey. What impossible challenge is Ray looking to take down next? He plans to paddle from Guam to Rota soon. As crazy as paddling to Rota sounds, imagine how impossible traveling 71 miles around Guam on foot sounded and using only natural resources before Chargualaf and his group did it.